The ankle is designed to withstand heavy impacts throughout the day. Whether by wear and tear, injury or disease, the ankle can break down resulting in the need for ankle surgery. When an ankle injury requires proficient ankle surgery, Advanced Foot & Ankle Care Specialists in Dallas can provide comprehensive ankle surgery solutions. Dr. Kennedy Legel integrates the latest medical techniques and advanced equipment to surgically repair the ankle. As a compassionate Dallas ankle surgeon, Dr. Legel offers practical solutions to help his patients get back to their daily routines as quickly and efficiently as possible. The ankle has ligaments located on both sides to provide strength, stability and support. When an ankle is injured, these ligaments can be torn and the ankle become unstable. The expected outcome for ankle ligament reconstruction is to restore its stability, strength and support. This surgery is most often arthroscopic and is done in an outpatient setting. When the small canal known as the tarsal tunnel compresses into the tibial nerve, the result is pain and discomfort. This condition is know as tarsal tunnel syndrome. The surgical procedure to alleviate the pain is called tarsal tunnel release. This is a surgical procedure that literally releases the tibial nerve from the compressed area. This surgery is usually performed in an outpatient facility. Whether because of wear and tear, disease such as arthritis or an impact injury, bones in the ankle joint can be damaged. Ankle replacement surgery is a replaces the damaged ankle joint with prosthesis. The replacement is determined by the location and severity of the damage. The goal of this ankle surgery is to restore the ankle to its full range of motion. Ankle fractures and broken ankles are some of the more common conditions we see at our Dallas podiatry clinic. Ankle fractures can be caused impact injury or by rolling the ankle. Often, treatment may call for simply wearing a stabilizing boot. 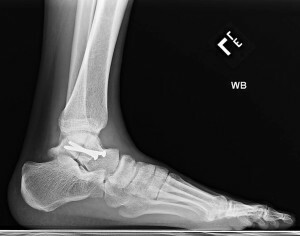 However, a severe fracture that has caused the ankle to be out of place or if the ankle is extremely unstable, then ankle surgery may be required using special screws and metal plates. If you are considering ankle surgery, contact our Dallas clinic to schedule an appointment with our ankle surgeon. For your convenience, you can contact us using the online contact form located at the top of this page, or call direct: (214) 366-4600.